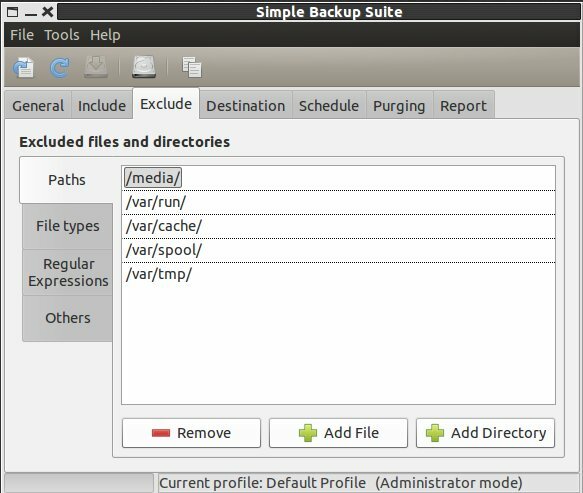 Using SBackup as Data Backup and Recovery Tools in Linux: After showing you how to use Back In Time, it is time to feature another simple backup tool called SBackup (also known as Simple Backup Suite). This GNOME-based backup software is capable of backing up any subset of files and directories and exclusions can be defined by regular expressions. Backups can be saved to local directories or remote servers using GIO/GVFS technology. You could also use the Ubuntu Software Center when installing SBackup. For non-Ubuntu users, you may get it using your package manager or from HERE. 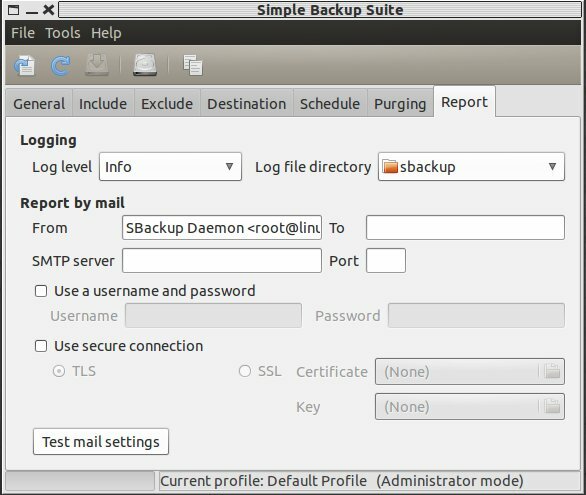 After installing SBackup, run it by navigating to System Tools --> Simple Backup-Configuration, and then provide your login password. 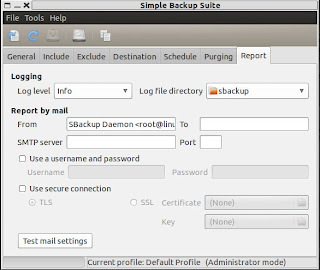 SBackup is really easy-to-use and has an intuitive user interface. But I would like to give a quick walk-through for those of you who need a little guidance. Under the 'General' tab, you can set the time frequency you want to do a full backup and the compression format. 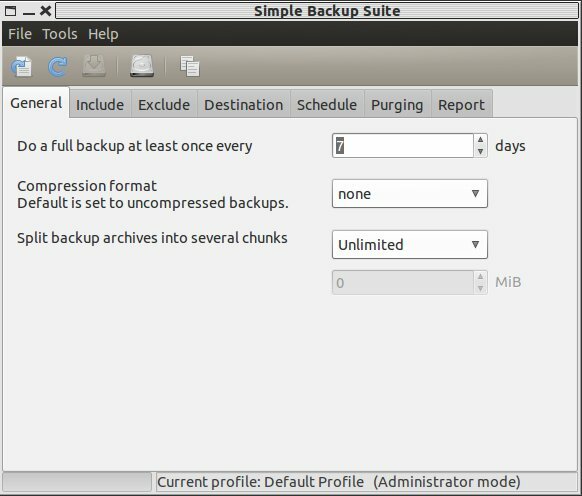 You will also be given an option to split backup archives into several chunks. The 'Include' and 'Exclude' tabs can be used to set the files and directories that you would like to include or exclude in your backup data. The 'Exclude' section gives you more options and allows you to specify paths, file types, and regular expressions so feel free to explore. Inside the 'Destination' tab, you can set the location of your backup directory. You may use the default backup destination or chose your desired backup directory. 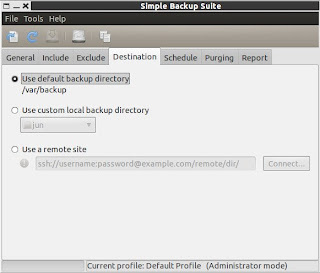 It is also possible to backup your files to a remote site using SSH or FTP. Under the 'Schedule' section, you can set the time or schedule when you would like to automatically backup your files. 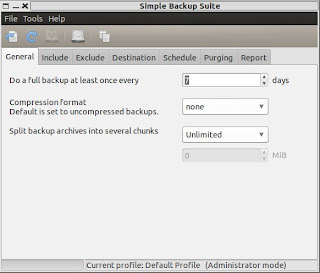 You may also disable automated backups by choosing the 'No scheduled backups' option. 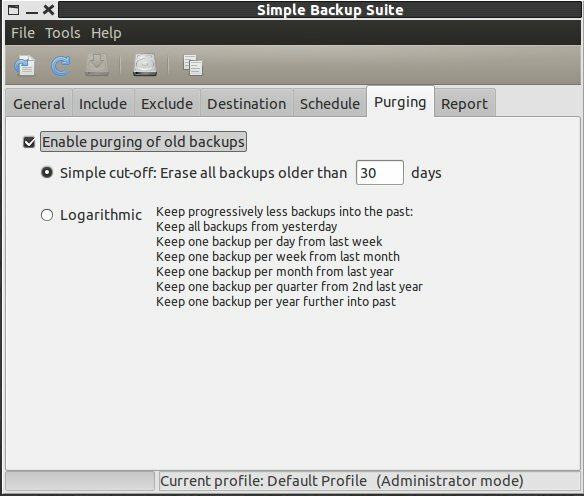 You can manage your old backups inside 'Purging'. 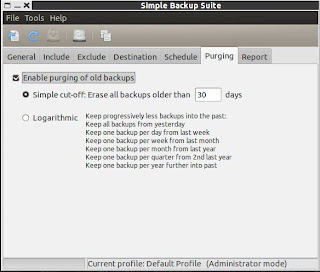 You are given an option to erase all backups older than your preferred number of days. You can also utilize a logarithmic setting where one backup from the previous day, week, month and year are saved and the rest erased. The last section is 'Report'. Here you can set the log file directory and log level. It is also possible to send the log files via email. 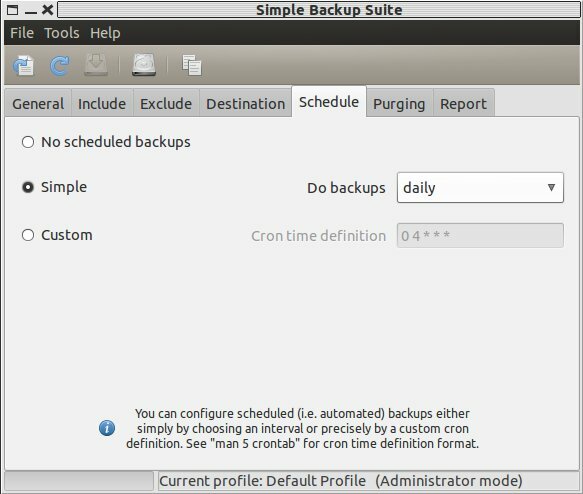 If you are pleased with the configuration, simply click on the "Make a backup now" button to start backing up your data, and then wait for the process to finish. To restore, go to System Tools --> Simple Backup-Restoration, enter your password, and choose the files that you would like to restore.